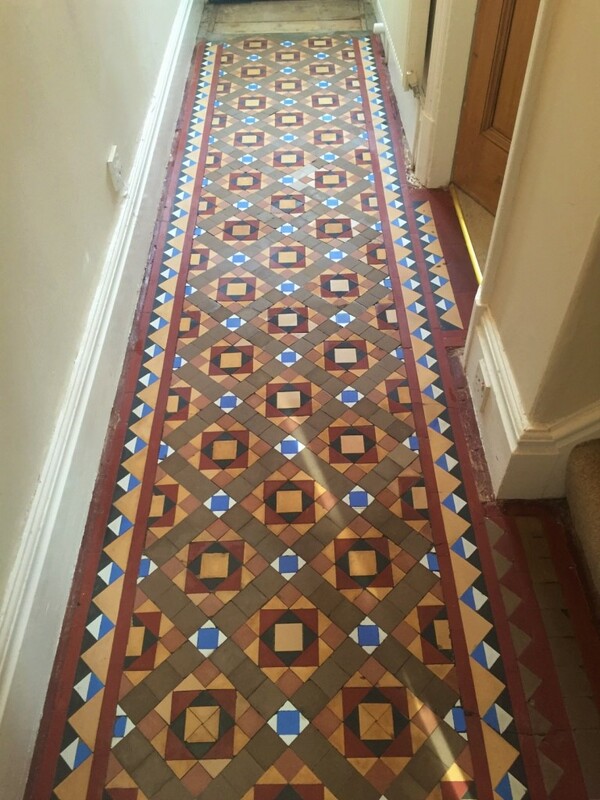 A customer who lives in Kendal recently called us out to examine their Victorian tiled hallway which when walked upon, sounded like it was a making a crunching noise. This may seem like an odd phenomenon, but it can be reasonably easily explained. These tiles, being made of Victorian-style encaustic cement, are very hard-wearing. However, the cement screed upon which they were laid had lost its bond with the tiles and the tiles were now loose. Most other types of tile would crack under the pressure of being walked upon, but since Victorian tiles are quite small and hard-wearing, they don’t seem to suffer this problem. Instead, they just make this crunching noise when walked upon. So, what would we need to do to resolve the situation? In theory, it should be the simple matter of taking up the loose tiles and relaying them. Yet this takes a lot of preparation, including removing the old cement from the back and sides of the individual tiles and then smoothening the floor so that the tiles can be re-laid flat. This is easier said than done with a floor of this age. 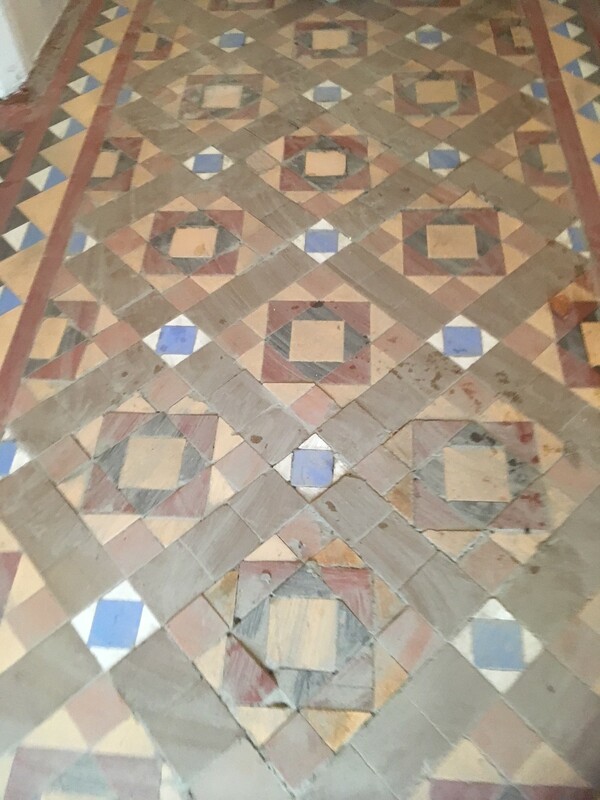 We began the restoration by lifting the loose tiles, cleaning the old cement off and then re-laying them using a suitable tile adhesive. Once the adhesive had set, we grouted the tiles with a grout that matched the original. The floor was left to set overnight, and we returned to the property the next day. The floor was checked and then we carried out a full deep clean of tiles using Tile Doctor Pro Clean, our go-to cleaning product for tile, stone and grout. The product, which is alkaline-based, was worked into the tiles using a black buffing pad fitted to a rotary machine. In some of the harder to reach areas and corners of the room – those which the buffing rotary machine struggles to reach – we used diamond-encrusted handheld blocks to grind away the stubborn dirt and stains. The soiled cleaning solution was rinsed off the tiles with water and extracted using a wet vacuum to get the as much moisture off the tiles as possible. After the cleaning process was complete, we left the floor for another few days to dry off completely. A suitable drying period is especially important for Victorian tiles, since most of these old properties do not have a damp proof membrane installed. We then returned to seal the tiles with several coats of a breathable, impregnating sealer called Tile Doctor Colour Grow that not only protects it also enhances the natural colours in the tile. Now, much to the customer’s pleasure the tiles are fully functional again with there’s no crunching noise when you walk on them. They also look amazing as well. 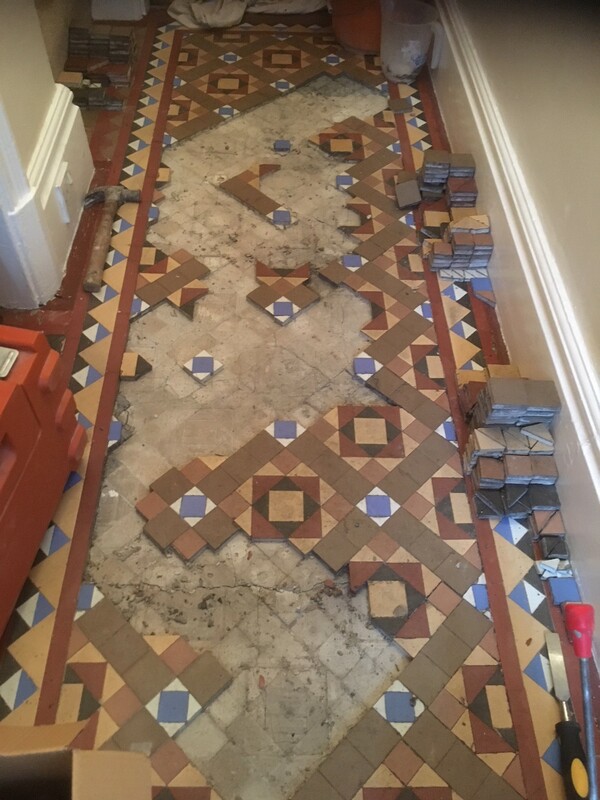 You will see in the photos below the level of work that goes into a job like this but, as this is an original Victorian floor, a restoration will add great value to the house upon re-sale.